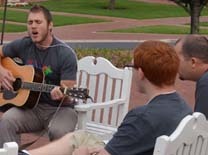 May 18-20, 200 Go Now Missionaries gathered at Dallas Baptist University for Orientation. They were prepared for service through worship, training sessions and seminars. On Sunday, May 19, family and friends were invited to attend a Commissioning Service. Below is a peek into orientation from some of our students. 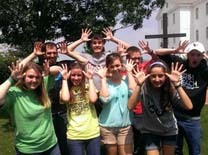 Our Go Now student missionaries will be serving from 2 weeks to 10 months in 13 different states and 21 countries. 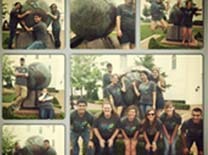 We are scattering Texas student to the nations! 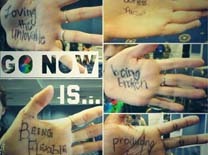 "Go Now Missions Is" Instagram challenge Sharel (UNT), will serve the fall semester in the UK. "I left orientation ready to go! Although I am not going until August, I have since told my community of believers back here in Denton about what I have learned to better equip them for missions where they are! I am so thankful and blessed. I feel that I learned so much and I think every follower of Christ should get the training we did because we are all called to go now and make disciples and what I learned has changed my walk with the Lord and I want to see more lives transformed so I am ready to share what I learned with everyone!" Chelsea (UNT), will use her media skills in Tennessee this summer. "I came to orientation without peace feeling spiritually restless and when I left God gave me more peace than I had in weeks. It was a challenge just getting to orientation because I was stuck in another state visiting family and almost couldn't get back to Texas because of flights. God knew I needed to be there and how much I would grow closer and go deeper in Him over the weekend. He was faithful and answered my prayers and I was able to get back Friday night before orientation. That was just the beginning. Throughout the weekend God showed me that I'm never alone. Even if I flew back hundreds of miles by myself, He was with me. And even when all of my family was in another state and couldn't come to the commissioning service, God was with me and hundreds of my brothers and sisters in Christ. Leaving my family behind to come to orientation and be obedient to God's call this weekend was a small act of faith that I believe God used to prepare me to leave for the field next weekend." Alaska Summer "Tribe" Travis (UT), will be part of a servant evangelism team in Alaska this summer, "Nearing the end of our first full day of orientation, my group (or "tribe") decided to have our unscheduled bible study over the Ephesians 6:10-20 passage. We were assigned the task of having this bible study on our own time at some point to give us an idea of what we may have to do in the field. As we began to direct the scriptures my group began discussing the character of God and what the passage meant to each of them. I sat silent and listened to the their words while I thought over the different pieces of the armor. When the conversation stopped I shared what had been keeping me silent for the previous half hour or so, 'Guys, I can't stop thinking about Iron Man.' After I got the laughs and giggles I expected, I began to explain what I was talking about. "Tony Stark wears an electro-magnet in his chest that keeps shrapnel from creeping further into his heart. Stark later improves upon his magnet, creating the arc-reactor, and it powers the famous suit of armor that Iron Man wears. This suit is extremely powerful and Stark uses it to fight several different evils and save thousands of lives from danger throughout the series. As the series progresses, Stark is constantly working on new versions of the suit with better abilities and stronger designs. [Small Spoiler] When Stark is separated from his suits in Iron Man 3, he does everything in his ability to get back into his armor because he realizes he is only as strong as his armor. Once he is in the armor he must make the choice to push himself to the limits of the armor in order to save his loved ones (Pepper) and defeat the evil that he is presented with. "This is a story that, after reading about the armor of God, has a huge connection between our faith as believers in Christ. CLICK HERE to read the rest of the blog. 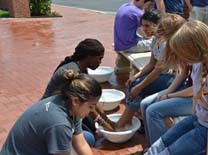 Team Footwashing Emily (Midland College) will spend her summer serving others in Florida. "One of my of my favorite thing this weekend that has been something I like doing every time I'm with Go Now is the washing of our teams feet. To be able to pray for your team or teammate and be so humbled, almost putting yourself in the servant position is amazing. Jesus was so quick to wash others feet and be a servant to them, we are called to follow in His steps putting ourselves out there whether it is washing your teammates feet or letting a baby pee on you while the mother learns about Christ, We are doing his work and sometimes we have to be humbled and brought back down to earth." "Go Now is going to the nations" Instagram Kacy (TAMU), will be sharing Christ in Russia, "I was standing in a circle with some of my friends from the Aggie BSM when we realized that we were all going to different countries-- it was so strange to think about how close we were at the moment, but how far apart we would soon be." 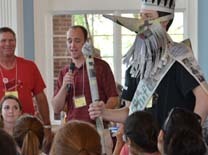 House ChurchDeEdra (UH), will serve in a home for unwed mothers in Georgia. "A few things I enjoyed most from orientation were my tribe's house church service and our bible study time. Our hearts were so evident during these intimate moments and I got to see the how the life of Christ shines through each of us differently. Fellowship is one of my favorite things and it is so refreshing to be around Christians who are honest about their weaknesses and excited about their God. Also, I really liked the Emotional Intelligence session. It brought many things to light for me and I was able to adequately share it with a friend back home and they feel the same 'light bulb' feeling that I did." Partner with us as we take the love of Christ to 13 states and 21 countries this summer. You would just need to click here to become a financial partner. All gifts are tax deductible.